The water stands almost still below the bridge, mirroring the curved arches in the early light. A queen built it for pilgrims on the road almost a thousand years ago. Different routes converge here, one from the north, the other from the south, and pilgrims needed a safe passage over the river Arga. They still do. The bridge and town carry her legacy in their name, Puente de la Reina, the Queen’s Bridge. There are other bridges now, bridges with cars, trains, and trucks, but we still walk this one, adding our feet to the thousand years of pilgrims that chased the sun west. The bridge connects us with them, like it connects one bank to another, a part of the weave the Camino spins. I walk the cobblestones behind Jorgelina and Amelie from Germany. Tonight Jorgelina will pack mate in the pink cup she carries, the drink a reminder of her home in Argentina, and offer me a sip as I cook dinner. Amelie will sit next to us on a bench and laugh as we celebrate the day. I stay on the bridge as they drift on, staring at the water. It’s structure is beautiful, arches rising to a point, stone pillars designed for the current, each rock cut and placed with certainty. I walk underneath to see the arches. The two young Koreans pass over while I’m down there. They invited me to share dinner with them last night then worried that the food would be too spicy. My mouth burned, but it was delicious. I snap a few pictures of them as they cross. They smile and wave and hold their arms up in triumph. I’d bought plantains in Pamplona to cook for anyone who cared to try before they ever invited me to eat with them. Luck, some would say. Others might call it divine inspiration. Maybe it’s just that we aren’t strangers anymore and you always look out for your friends. By the time Daya arrives, I’m standing on a far bridge, staring at Puente de la Reina reflecting off the water. I take more pictures then wave her over to see the reflection from afar. We’ll spend the early afternoon with Jorgelina in the aisles of a grocery store buying the ingredients for my abuela’s arroz con pollo. We won’t find garlic, but back in the kitchen Won Gyu will give me three cloves he has been carrying. He arrives on the bridge next. Daya and I shout across the water so he will see us and pose for a picture above the arches. I think of the three of us walking in the fog the first morning, of how far we’ve come, of the conversations we’ve had, the stories we’ve shared. We waive him over to see the reflection and stand there for a moment, together in the morning sunlight, staring at a bridge that has connected pilgrims for a thousand years. Posted in Europe North to SouthTagged Camino, Camino de Santiago, ENS, Europe North to South, featured, Puente de la reinaBookmark the permalink. And remember, you are walking in the area where you great grandfather and great grandmother grew up. Your grandfather’s nickname within the family was “El Gallego”. And your bridge does justice to a bridge named after a queen — wow! Great photo and most excellent blog! As with every part of this trip, I’m really enjoying walking the El Camino with your blogs and enjoying everyone you write about!!! 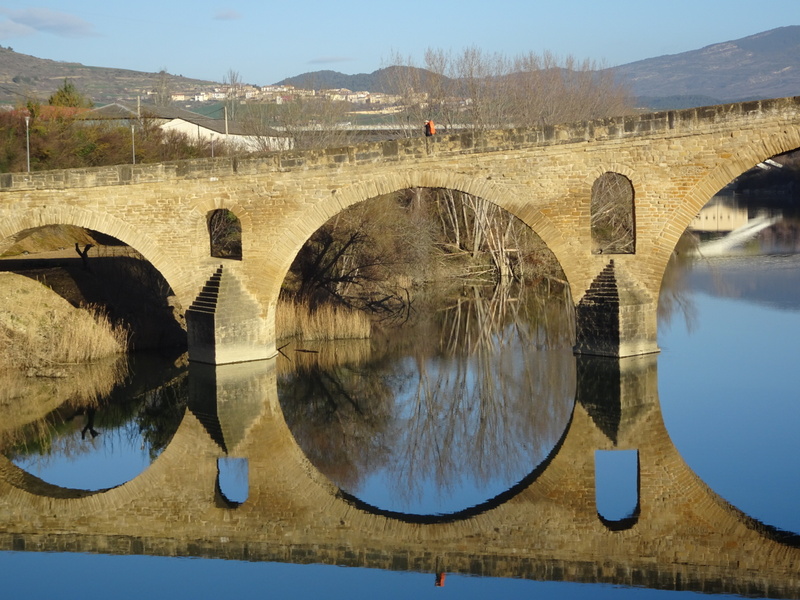 When I opened this blog and saw the photo of the bridge and reflection “Wow!” came out of my mouth! Beautiful. Wonderful to see how the group of you have continued to travel and share. Sweet! So fun to hear about the companions you meet and travel with on your journey. Namaste.